Pierce loves doughnuts. With a passion. Every few weeks, he’s asking for them again. I offered to make homemade, and while he was skeptical, it was his only option, so he agreed. 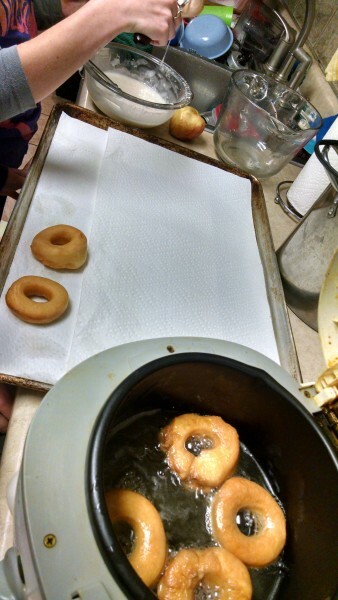 Pioneer Woman’s glazed doughnuts, for the record, makes 49 doughnuts and 49 doughnut holes. 9 people can finish off 46 doughnuts and 43 doughnut holes in a day. I lined 2 cookie sheets with racks to dry glazed doughnuts. It took 35 doughnuts before we had accumulation of more than 4 drying pastries. Sometimes, the sheer numbers astound me. Rotovirus has passed. So thankful. Wicked virus. Bad attitudes from being catered to during said illness can pass any minute now as well. Please. I finished two sewing projects yesterday. I sewed until midnight, and sometime apparently later than I ought to have been sewing, my machine was grumbling slightly about a thick spot, and the fact that nothing thick ought to have been in that particular spot didn’t occur to me – until I looked at the back of my fabric after I finished. Glaring at me with three nice neat stitches through it’s center, thread stretched between each stitch, was a plastic KAM snap. Yup. Sewed right through it. Janome makes a workhorse machine. It didn’t even bend my needle. Next up: finish my half done maternity dress. Preferably before I’m no longer pregnant. I lack motivation these days. I went to the regular doctor the other day. Six years in this town and I’d yet to see a doc beyond the OB… Seemed time. It was mostly a meet the doc “physical” appointment, with no actual exam since I’m under doctoral scrutiny these days anyhow, but I asked him about a weird painful toe and waited for him to tell me it was horribly infected and meds were off the table until after baby. He didn’t. He said I’d hurt my toe. I have no recollection of any injury. I came home and threw out the blanket “Anybody remember me hurting my foot? !” Charlotte started scrambling, recounting dropping not one but two metal water bottles, full, on my foot. She claims I rather howled. Blaine nodded in agreement, having heard the tale, apparently. Still no recollection. But… injury sounds far less disgusting than what I’d imagined it could be with a bit of Google help. For the record, tea tree oil and Vick’s vapor rub do not heal toes squished by water bottle injuries. Vick’s does provide a cold toe sensation that’s particularly annoying, however. Sometimes, I just have to laugh. My memory and thought process has clearly been through the ringer and is still trying to find out which way is up. Lots of doughnuts/holes. HA!! So glad the bad virus has left. Hopefully not to return. Maybe you can get your dress finished and wear it at least a couple times. I wish I could sew. Just not my thing. Ha!! Maybe your toe will be well soon too. It is crazy how we can hurt ourselves and not remember it. Liberty, the doughnut sickness will pass by the time your mother makes doughnuts again – trust me on this. You’ll be ready for more in no time. Loved Pierces analogy of the doughnut holes. They do sell the doughnut holes Pierce, but they make you pay extra for them. Doesn’t seem right does it! So glad everyone is well again – it was a long bout of rotovirus. Vicks vapro rub on your sore toe Adrienne? That was for chest colds when we were young. Hmm not surprised it didn’t work – Ha!